This post was sponsored by Starbucks as part of an Influencer Activation. I received compensation and complimentary products to facilitate my review. Certain foods are so distinct and delicious that I will always remember the first time I tried them. For chai latte that was at a local coffee shop here in San Diego about ten years back. I had heard chai being mentioned long before then but thought it might just be a fad flavor that wasn’t for me, something that you might not hear of after another few years. I was proven very wrong that night and as that first sip touched my lips I knew that I had found something very special to me. I must have gone back to that same coffee shop and ordered the same big cup of chai latte 30 or 40 times since then. Call me nostalgic but that local coffee shop will always be my favorite place to enjoy a chai latte. I’m really happy though as I can now enjoy the same great taste right at home, even during my busiest mornings. That is all thanks to the new TAZO® Chai Latte K-Cup® pods. The K-Cup® pods (that I use with my Keurig®) have been a life saver for me as I’ve been able to get my mornings off on the right foot. While getting my kids dressed and preparing their breakfasts and lunches I really need something enjoyable and a little something just for me. With K-cups I’m able to get that without missing a beat. Now that I can add TAZO® Chai Latte K-Cup® pods into my rotation I am thrilled! 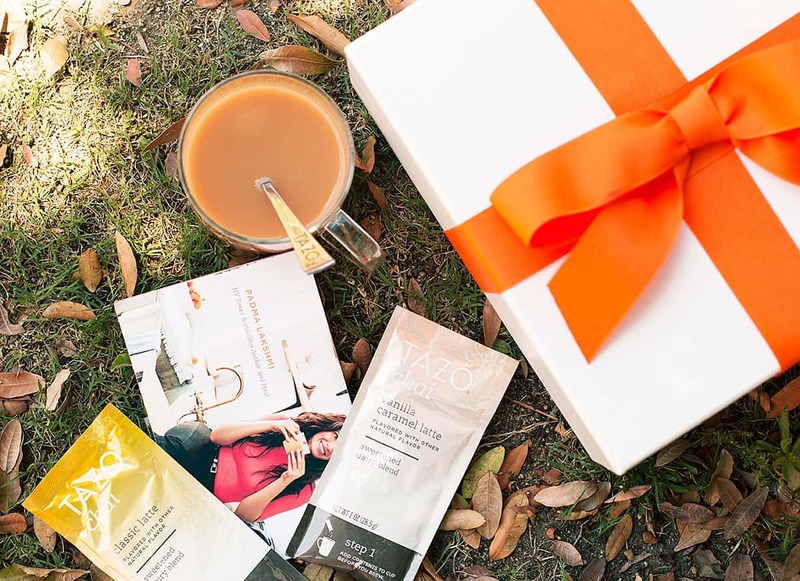 The fact that this tea comes from TAZO® too is huge as I’ve been a big fan of their teas for years (one of my favs is their Passion Herbal Infusion Tea). 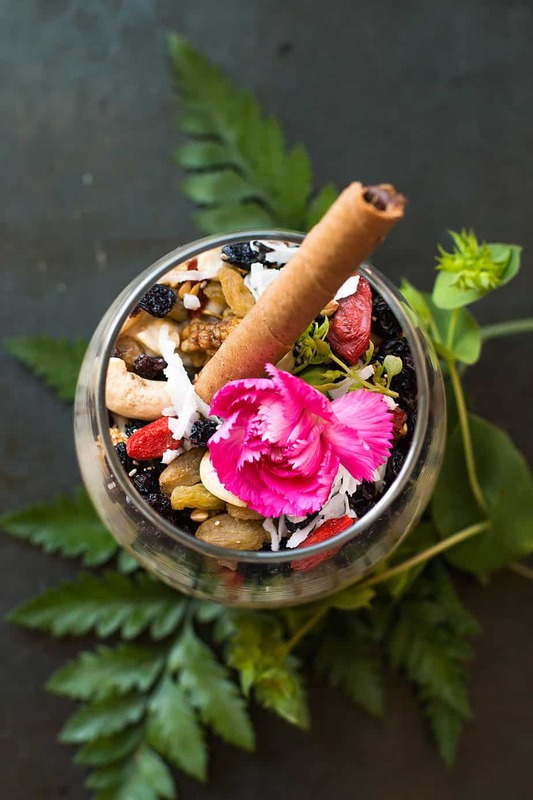 They specialize in only selecting the purest tea ingredients so your experience of drinking tea is exactly how it should be, healthy and naturally refreshing. 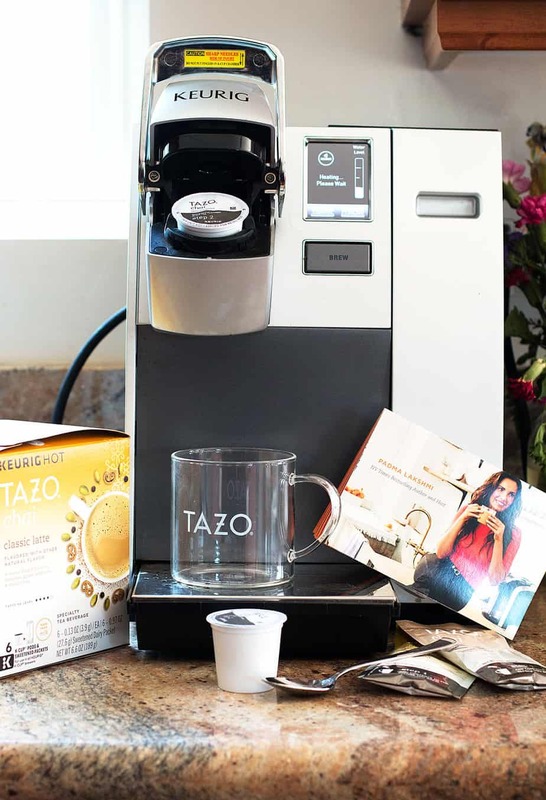 Even before I tasted the TAZO® Chai Latte K-Cup® I was brought to another place as the aroma mixes in a great blend of ingredients from ginger to cinnamon, the very distinct cardamom all balanced with a touch of vanilla. Upon my first sip I felt as though I’ve been transported to a street market with the best spices around, possibly someplace like Morocco or Turkey, or more appropriately India, where the sweet and sour drink originated many moons ago. There are some moments of bliss with each hot sip of milk, tea leaves and spices is just what I need to center myself and continue with whatever problem is at-hand, (even the most critical ones like my daughter’s endless problem of disappearing socks). 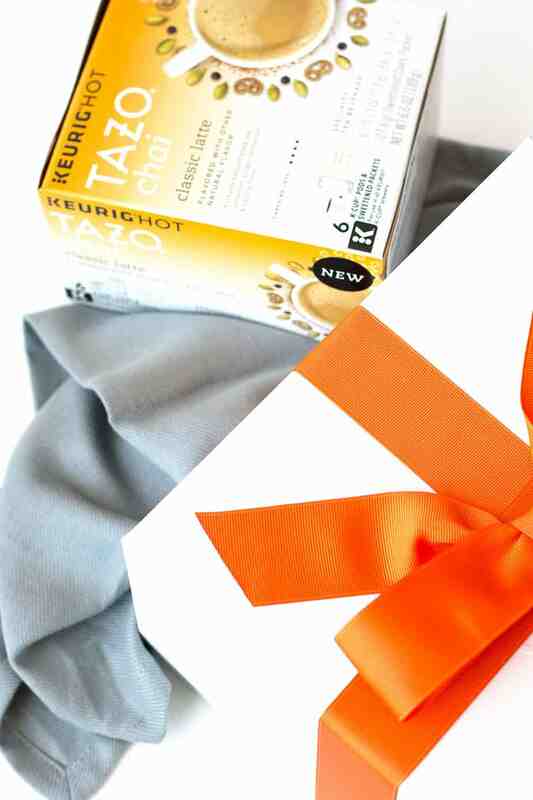 Brew 2 TAZO® Chai Latte K-Cup®. While tea is brewing combine sugar and 3 cups water in a sauce pan. Add vanilla bean (or vanilla extract as another option). Bring to a boil, stirring occasionally until sugar is dissolved. Add plums and simmer, uncovered for 3 minutes. Add apricots and 2 cups of tea from from TAZO® Chai Latte K-Cup®, then return to a simmer. Cook for another 5 minutes and remove from heat. Add gelatin and stir for 5 minutes until gelatin is completely dissolved. 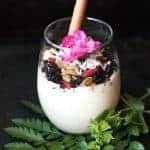 Beat cream cheese and Greek yogurt with electric mixer on medium speed until creamy, then gradually add gelatin mixture, beating until well blended. This is such a unique and GORGEOUS dessert! Your photography is amazing. Wow…that looks amazing. I love the idea of using the tea to make this lovely dessert. I imagine the flavor is absolutely wonderful and I love the addition of all the nuts and dried fruits. Very pretty. Such gorgeous photos! I love all those garnishes and that the pudding is no bake. Definitely a perfect way to use the chai latte. Beautiful photos!! 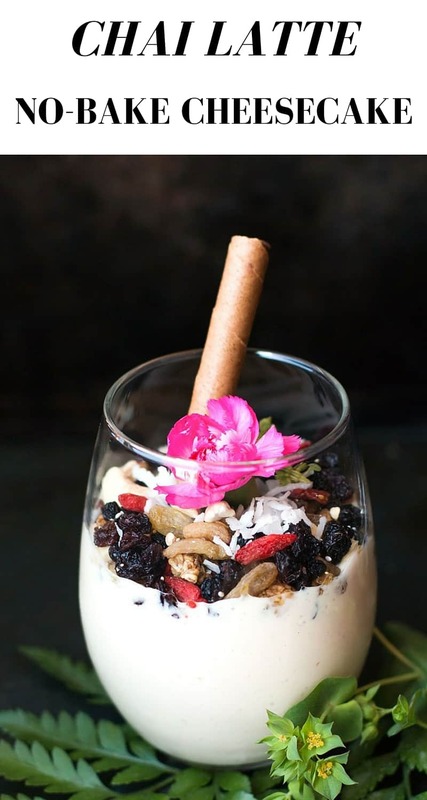 Never thought of making a chai pudding!! This is so pretty! 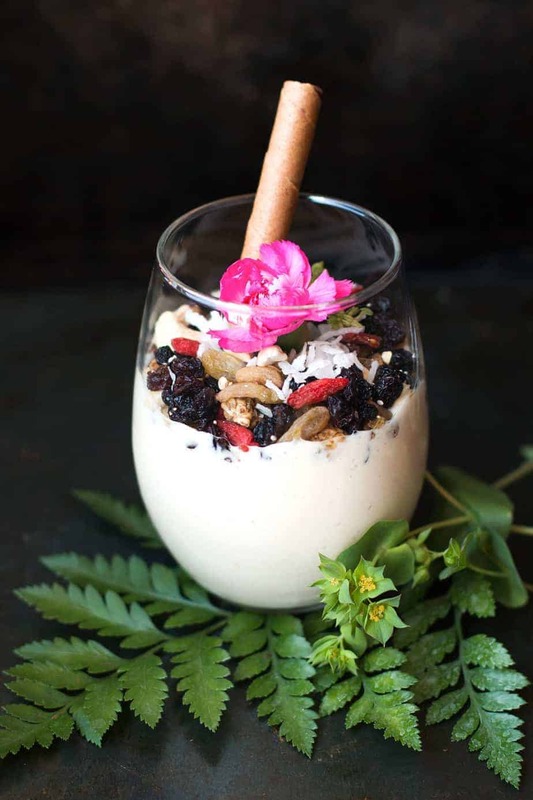 I love chai and I am always looking for new recipes to try! I love you full wide photos ?